Central Asia as a region is hard to define with any real accuracy. The term has different meanings for the different writers and nations that have used it, varying from the tight modern Russian focus on those states that are located between the Caspian Sea and the Himalayas, to the much broader usage of western scholars which can see it reach as far as the Urals in the west (the usual border between Asia and Europe) and the limits of China in the east. In terms of the archaeological evidence that underpins the various cultural designations used here, the latter term is generally applied, although perhaps referring to it as central Eurasia would be preferable if it wasn't so cumbersome. The system that evolved in the early twentieth century to help chart the rise of civilisation was one that involved cultures, with each culture being defined by distinct similarities in burials, settlements, technology, or objects in space and time. Archaeological cultures remain the framework for global prehistory. These cultures are defined on the basis of pot sherds, grave types, architecture, and other material remains. They are meant to capture and define regional variation within a broad sweep of generally similar artefacts. They show the progress of cultural advancement, where such advancement usually means replacing one culture with another to highlight a marked progression. This practice tends to result in a profusion of cultural names, some of which refer to the same culture but which bear different names when they cut across modern national borders. Every attempt has been made here to combine different cultural names that refer to the same culture. The relationship between the archaeological cultures listed here and the living cultures which they represent may seem tenuous, but every attempt has also been made to link, where possible, perceived social and linguistic cultures with their matching archaeological cultures. The social and linguistic fields are more theoretical than the archaeological ones, and there is resistance on both sides by academics when it comes to accepting the other, but recent progress has shown that both disciplines can work well together. The earliest cultures are perhaps the easiest to catalogue and also amongst the most frustrating, the latter due to the relatively small number of artefacts (and also population figures) left behind to provide evidence of existence. The beginnings of human history in Central Asia date back to the late Pleistocene, between 35,000 to 25,000 years ago, which includes the last full interglacial period and the last glaciation. The latter was followed by the interglacial period that still persists today. In Europe the Aurignacian culture of the Upper Palaeolithic coincided with that last glaciation, which was much more severe in Europe than in northern Asia. Siberia below the latitude of 60° N was ice-free (although not without associated freshwater flooding-related problems). From this point in time, this and various other cultures emerged, some replacing earlier ones, while others were expressions of human expansion (see the 'Prehistoric World' index for information on pre-modern human Earth, via the link on the right). Two of Central Asia's natural vegetation zones have played a prominent part in the continent's history. These are the forest belt, which is between eight hundred to 1,600 kilometres wide (five hundred to a thousand miles) and, to the south of it, the steppe, a vast grassland that extends eastwards from Hungary to Mongolia. The latter area facilitated ancient communications and provided an ample supply of grass, the only raw material that was absolutely essential to the creation of the early cattle-herding cultures (starting around the time of the Dnieper-Donets II culture). The vast forests played host to various forager cultures that were eventually influenced to some extent by the cattle-herder cultures. The frozen marshes of the north and the deserts in the far south played only a minor role in Central Asian prehistory. Cataloguing the vast range of human cultures is a complex process. It starts off reasonably easily, with the result that most early cultures can be included on this page. As cultures become more numerous, and rival cultures spring up in different regions at the same time, listing them on one page becomes more complicated. Care has been taken to log rival and neighbouring cultures in each entry but, after a certain point, when the cultures become so regional that they can be located almost entirely within the borders of a single modern nation, then they will be shown in the relevant page rather than here. The easiest way to view it all is as the roots of a tree, with the main trunk starting here and heading down through the page (ie. into the soil) and the ever-smaller roots forking outwards to link into other pages. The origins of 'Asia' as a name appear to be in a confederacy in western Anatolia known as Assuwa or Assua. Certainly by about 1400-1300 BC this confederacy had already been formed by a number of regional minor states which, collectively, were allied to the Hittite empire that dominated Anatolia at that time. The city of Troy (or Wilusa) was also a member of this confederacy. However, a far older word could be the basis for 'Asia' as a name. This option relates to the Indo-Europeans and their spread from the Pontic-Caspian steppe to dominate Central Asia (see the feature link, right, for a fuller exploration of this theory). It is safe to assume that prior to this period Siberia and the sub-Arctic areas of Europe belonged to the same civilisation, this being the Aurignacian culture. The Aurignacian succeeded the Neanderthal-led Châtelperronian culture. There may be some crossover finds that are assigned to the latter but, essentially, that was the final expression of Neanderthal mastery of Europe. The humans of the Aurignacian displaced Neanderthals, consigning them to a slow extinction in southern Spain. Theirs was the first modern human culture outside of the Middle East because it saw the first expressions of culture - the creation of artistic figurines and cave paintings, and possibly burials too. The differentiation between Central Asia and neighbouring cultures did not begin until Neolithic times, and was marked by tremendous technical progress and a wide diversification of cultures. This Upper Palaeolithic (Late Old Stone Age) culture was located in Siberia, largely as an eastwards expression of the European Gravettian culture but with its own development and expression. It is known from a vast area of Asiatic Russia which spans the River Yenisey (to the north of Tomsk and the border between modern Kazakhstan and Mongolia) and the western shores of Lake Baikal (to the north of central Mongolia). The site of Mal'ta - the second syllable is stressed - lies about a hundred kilometres north of Lake Baikal. It is composed of a series of subterranean houses that were made from large animal bones and reindeer antler and which had likely been covered with animal skins and sod to protect the inhabitants from the severe, prevailing northerly winds. The site of Buret' is a little way to the north of Mal'ta, along the course of the River Angara. The culture (known in full in Russian as Maltinsko-Buretskaya) also seems to have been involved to an extent in the Palaeo-Indian peopling of the Americas. Another (Late) Upper Palaeolithic culture soon emerged alongside the Mal'ta-Buret' in north-eastern Asia. The Afontova Gora culture bears clear cultural and genetic links Mal'ta-Buret', probably being an eastwards expression of it. There were no Neanderthals alongside modern humans in Siberia but there was another human species - the Denisovans. Knowledge about them is only recent (since 2010), and is still undergoing a process of understanding and expansion (see feature link, right). They would have occupied areas of Siberia and parts of Asia when Homo sapiens arrived and, it seems, by around 18,000 BC years ago populations of H denisovan and H sapiens were interbreeding on mainland East Asia. The third oldest-discovered Homo sapiens genome (by 2016) comes from a boy who dies around this time, near the Siberian hunter-gatherer village of Mal'ta. Generally part of the Gravettian culture, itself a development of the broader Aurignacian, this boy also belongs to the more regionally-specific Mal'ta-Buret' culture of Siberia. 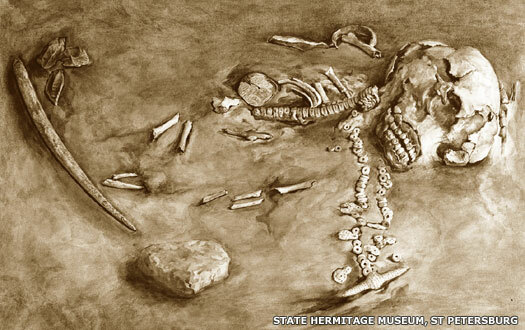 The boy's DNA shows close ties to that of today's Native Americans. Yet he apparently descends not from East Asians, but from people who had lived in Europe or western Asia. The findings suggest that about a third of the ancestry of native Americans can be traced to 'western Eurasia', with the other two-thirds coming from eastern Asia. It also implies that traces of European ancestry that have previously been detected in modern native Americans do not come solely from mixing with European colonists, but have much deeper roots. Around the same time, a sharp freeze could be responsible for dealing the dwindling Neanderthal populations in Europe a killer blow that finishes them off. A climate downturn may cause a drought, placing pressure on the last surviving Neanderthals by reducing their supplies of fresh water and killing off the animals they hunt. The cause of this chill may be cyclical changes in the Earth's position relative to the sun - so-called Milankovitch cycles. The resultant cold event seems to be pretty severe and also quite short. The Siberia region during the Upper Palaeolithic is still poorly understood. The people who lived in ancient Mal'ta have lived a semi-nomadic way of life and have built dwellings that are temporary but rather well-founded. As hunter-gatherers they have hunted mammoth and reindeer for meat, bones, and fur and, to an extent, fish too. Around this time their habitat may be affected by the most recent glaciation to occur in Siberia. The Sartan glaciation, although contentious and not fully agreed, theorises the formation of a vast freshwater lake covering much of the West Siberian Plain. Stretching some 1,500km from north to south, and a similar distance east to west at its widest points, at its maximum extent it may have had a surface area at least twice that of the Caspian Sea. Formed by the damming of the Yenisei and Ob rivers by an eastward lobe of the Ural and Putorana ice sheets, this mega-lake appears from the available dates to reach its maximum extent by around 22,000 BC, and to exist in some form until around 10,000 BC (three thousand years longer than the Black Sea has existed in its current form). At the end of this period the lake may drain into the Arctic Sea, perhaps with regionally-catastrophic effects. The neighbouring Afontova culture continues to survive for another millennium or so.